If you intend to become a Texas resident, you must have your vehicle inspected and registered in the county of residence, get a Texas driver’s license, and get Texas vehicle insurance. You can also register to vote in Texas, employ a Texas attorney, join a local library, or establish a Texas bank account. These actions show intent to make Texas your “domicile” (see below). Many clients are able to use a Texas Home Base address as their “domicile” (see below) to make the aforementioned efforts to establish residency in Texas. If I use the Scanning or Forwarding Service, do I have to become a Texas resident? No, if you would like to only use our services as a mailing address and for the convenience of using a Mail Forwarding Agent then you do not have to become a Texas resident. How long does it take to receive my new address? Once all completed paperwork is in the office, your new address will be issued the same day it is received or no later than the next business day. Can my children receive mail at my Texas Home Base address? Yes, your children can receive mail at your new address. Please let us know the names of your children on your contract and their mail will be sent to your forwarding address. If they will need separate forwarding instructions with each mailing, they will need a separate contract. If I have a traveling companion can we both be on the same contract? Yes, if we forward the mail to the same address each time. If there are separate forwarding addresses, then each person will need their own contract. To add your traveling companion to your contract, they will need to fill out a separate USPS 1583 form to send to Texas Home Base along with 2 forms of ID. For more information click here. How long has Texas Home Base been in business? Texas Home Base has been in business since November 2002. What county is Wichita Falls located in? Wichita Falls is located in Wichita County. We are 2 hours south of Oklahoma City, OK and 2 hours north of Dallas, TX. What is the best way to contact Texas Home Base? Email is the best way to contact us. * However, if you need to call our office, our toll free phone number is (866) 766-2095. Office hours are 9:00 am to 5:00 pm Monday through Friday CST. You can call and leave a message anytime. How will I know how much money is in my Postage Account? If you would like to know your Postage Account balance, you can email Dru at accounts@texashomebase.com. How can I add money to my Postage Account? To add money to your Postage Account, you can either use our Postage Account page or you can email Dru at accounts@texashomebase.com with your request. What will happen to any remaining postage in my Postage Account after I have ended my contract with Texas Home Base? We are obligated to forward any mail we receive for you for 6 months after your contract has ended if you have money left in your account. After that 6 month period, we will refund the remaining balance of your Postage Account. Can you forward mail internationally? Yes, we can forward mail to every country that USPS, UPS, FedEx or DHL services will deliver to. Is there a charge for changing my forwarding address? No, there is never a charge to change your forwarding address. Is there a handling charge to forward packages to me? No, there is no extra charge for forwarding small packages. We will only charge your Postage Account for the actual shipping cost. Can my mail be sorted and all “junk mail” and “non-profit” mail be separated? Yes, we shred all “junk mail.” You will be able to choose whether or not you would like to receive “non-profit” mail on your application. Can I have medications and packages sent to my Texas Home Base address? Yes, we do receive medicine and small packages. We ask that you do not receive packages over 20 lbs. Can I call or email to ask if a piece of mail is in my box? Yes, you can call our toll free number (866) 766-2095 or email Elaine at info@texashomebase.com. Will my bank accept a Texas Home Base address? Because of the Patriot Act, national banks may not accept a Commercial Mail Receiving Agent addresses for their accounts. What are the yearly/quarterly charges for the services? For more information on our Mail Forwarding services and their charges, please click here to see our Mail Forwarding page. For more information on our Mail Scanning services and their charges, please click here to see our Mail Scanning page. Can I complete a Change of Address on the USPS website? No, you will not be able to submit a “Change of Address” on the USPS website. You will need to fill out a physical copy of the “Change of Address” form at a local US Post Office. A domicile is a person’s fixed, permanent, and principal home for legal purposes. How does the Digital Mailbox Service work? When the mail comes into the office, each piece is named sequentially and according to the month it is received (ex. 08aug-01, 08aug-02, 08aug-03, etc.) Each document is opened, scanned, and uploaded to your Digital Mailbox once a week. Once you have read the mail you will instruct us to Hold, Shred or Forward with the options next to each document. Example – You may wish to have 09sep-01 and 09sep-02 shredded, 09sep-03 held for future forwarding, and 09sep-04 forwarded immediately to a forwarding address you provide. Does the Digital Mailbox webpage work on any kind of browser? The account webpage works on most internet browsers. At this time, many features of the account do not work on Internet Explorer. How does the Digital Mailbox look? The standard scanning plan protects your mail documents only with standard browser encryption. Mail documents are accessible and protected through account ownership. How will I instruct Texas Home Base to Hold, Shred or Forward my mail? Next to each uploaded document on your account, there will be options to Hold, Shred or Forward. You will select one of these options for each mail piece and then click the “Submit Options” button at the bottom of the screen. Below is an example of how this will look on your account. How will Texas Home Base know where to send my mail? You will update your forwarding address on your Digital Mailbox. When you instruct Texas Home Base to forward your mail pieces your mail will be sent to the Forwarding Address on your account. You can view this address by clicking the FORWARDING ADDRESS button on your account. When will I need to update my forwarding address? You will need to make sure the the forwarding address is correct before you select any documents to be forwarded. When your instruct Texas Home Base to forward your mail, your mail will be sent to the forwarding address listed on your account. What is the Hold folder on my Digital Mailbox? The “Hold” folder is used to store any documents you have requested us to “Hold.” We will hold these documents until you have instructed us to either “Forward” or “Shred” them. As soon as we have completed your “Forward” or “Shred” request the document will be deleted from your account. What do the numbers at the beginning and end of the document’s name mean? The first number on the document name is the month’s number, ex. Jan = 01, Feb = 02, March = 03, April = 04, etc. The numbers at the end of the document is not the day of the month the piece is received, but rather the number we have given the document. Do I have to set up a Postage Account if I use the Scanning Service? If you will never want any piece of mail to be physically forwarded to you then you will not be required to set up a Postage Account. However, if you request any piece of mail forwarded your card will be charged for the amount of postage used, plus a 10% processing fee. To add money to your Postage Account at any time – click here. Are you able to deposit a check if I receive one? Yes, for a yearly fee of $50 or a $15 fee every 3 months Texas Home Base can deposit your checks. If you use Wells Fargo, Bank of America or Chase Bank we will physically deliver your check. For other banks we will need a pre-printed deposit slip associated with your bank account number. 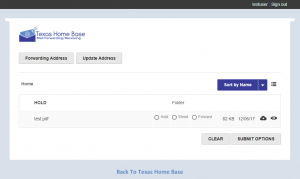 Texas Home Base will forward your check along with the deposit slip to your bank’s address. How long do we store your scanned mail? All scanned mail is securely shredded after 3 months unless we are instructed to hold specific documents per client request. What is the USPS Form 1583? This form authorizes Texas Home Base to receive our client’s mail. What else needs to be submitted with this form? The USPS 1583 must be accompanied with 2 forms of ID for each person receiving mail at your new address. Acceptable forms of ID include:valid driver’s license or state non driver’s identification card; armed forces, government, university, or recognized corporate identification card; passport, alien registration card or certificate of naturalization; current lease, mortgage or Deed of Trust; voter or vehicle registration card; or a home or vehicle insurance policy. Unacceptable forms of ID include: Social Security cards, credit cards, and birth certificates. Does this form need to be notarized? This form does require that you get it notarized. You should be able to find a local notary either online or at your local courthouse. Also, some banks have notaries available to their customers. If you are out of the country, you may be able to find a notary at the US Embassy or you may use a non-US notary to confirm your identity. Why does this form require a notary signature and IDs? These requirements are necessary to ensure that no one is trying to steal your identity. Does this form change my address with the USPS? No, this form does not change your address with the USPS. You will need to fill out a “Change of Address” form at your local Post Office. How can I send this form to Texas Home Base? How quickly do I need to submit this form? You will need to submit this form as soon as possible as your Texas Home Base contract will not begin until it has been received along with the acceptable IDs. How does the Emailed Scanning Service work? When the mail comes into the office, each piece is named sequentially and according to the month received (ex: aug01, aug02, aug03, etc.). Each document is opened, scanned and sent via email once a week. Once you have read the mail, you will instruct us to Hold, Shred or Forward each document. Example – You may wish to have 08aug-01 and 08aug-02 shredded, 08aug-03 held for forwarding, and 08aug-04 forwarded immediately to a forwarding address you provide. How will I instruct Texas Home Base to Hold, Shred or Forward my mail if I have use the email service? You will instruct us to “Hold, Shred, or Forward” via a reply to each weekly email you receive. We ask that you provide a forwarding address with each “Forward” request sent via email. How will my checks be deposited? Wells Fargo or Chase Bank accounts: Checks will be physically deposited after they have been scanned. All other banks: Checks will be sent via USPS 1st Class to the bank’s address. Can my checks be sent with a tracking number attached? If you would prefer your checks be sent via USPS Priority, FedEx, UPS or DHL with a tracking number your Postage Account will be charged for the cost of shipping. What information does Texas Home Base need for this service? Will I receive a deposit slip? If Texas Home Base has physically deposited a check to either Wells Fargo or Chase your deposit slip will be scanned and sent to you via email or uploaded to your account. A deposit slip will not be scanned if a check has been mailed to your bank. How much does the Check Deposit Service cost? This service has a yearly fee of $50 or a quarterly fee of $15. Is there a charge to dispose of “junk” mail? No, there is no extra charge to shred “presorted standard” or “junk” mail. “Junk” mail is shredded on site by a professional document shredding company. A certificate of destruction is available upon request. Can I place my mail on hold until I am ready to receive it? Yes, anytime you are traveling and unable to receive your mail, we can hold it for you. When you are ready to receive your mail, just let us know a forwarding address and the mail will be sent out. You are responsible to notify Texas Home Base of your new address or to take your mail off of hold. Texas Home Base will not accept forwarding addresses more than 3 days in advance. Will I receive Login information as a Mail Forwarding client? No, at this time the Digital Mailbox section of our website is only available to our Mail Scanning clients. If you have a question about Texas Home Base services that you do not see on this page, submit your own question by clicking here. If you would like to contact Texas Home Base directly, please see our Contact Us page. **This is strictly information. It is not intended to be legal advice. Consult an attorney for all legal matters.